Video sculpture. Analogue video monitor, acrylic, two-way mirror acrylic, DVD (SD, 4:3 with stereo soundtrack), DVD player, headphone amp, headphones, cables, screws and custom acrylic headphone hook. 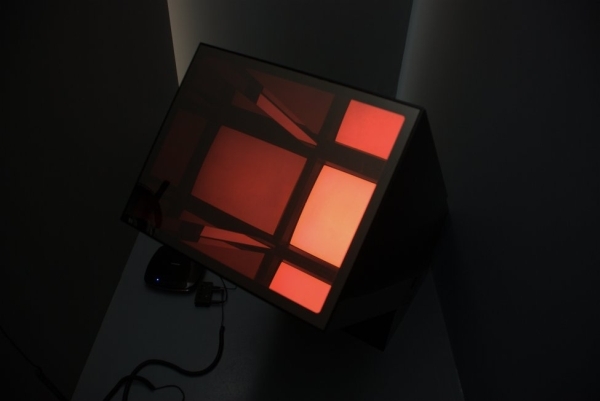 Physically, this piece consists of a monitor sitting on the floor and tilted at 45 degrees, with a shiny black acrylic tube attached to and supported by it. At the upper end of the tube, facing the viewer, is a two-way mirror. A pair of headphones hanging on the wall indicate where they should position themselves in relation to it. 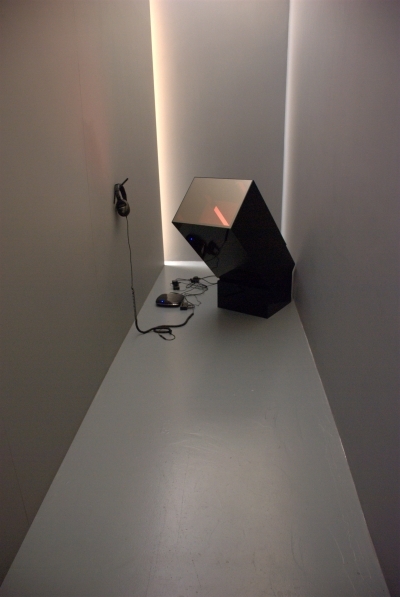 Standing close, listening to the soundtrack, the viewer's experience oscillates between two states. 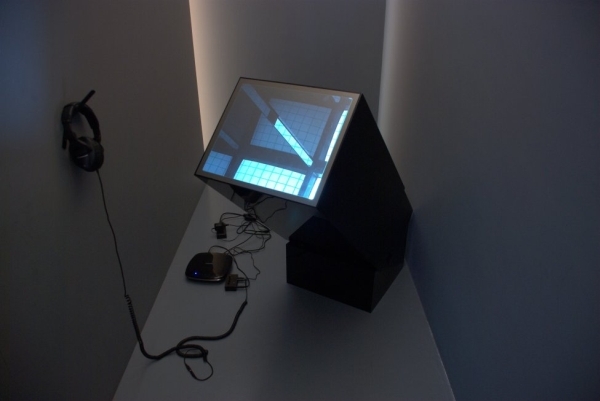 When the monitor is blank they see themselves reflected in the mirrored surface. The appearance of a video image interrupts this reflection. Their attention is redirected to the screen at the bottom end of the tube and the kaleidoscopic reflections it produces in the glossy surfaces of the tube's interior. A looped narrative describes a vaguely sci-fi scenario. An engineer attends the opening party for a building he has helped to construct. In the carpark on his way home, he has an uncanny encounter with a pulsing crystalline object. The work was shown as part of the group show Compendium at Temple Bar Gallery from August to September, 2009. It's important to remember that if you were viewing the work, the moments where the screen goes blank are the moments where you would see a reflection of yourself in the two-way mirror. The other images would be kaleidoscoped inside the viewing structure. Images show the work installed at Temple Bar Galleries.